WOWZERS! Today isn't going to be so wordless... more like wordy. I walked into a grocery store last night and this is the display I walked into. 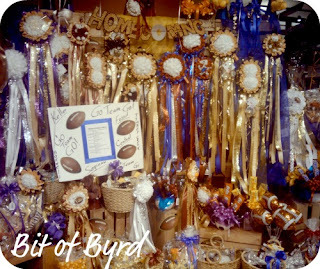 Now you know, I am not the only one going homecoming mum crazy! I will let you know that this was at Kroger. 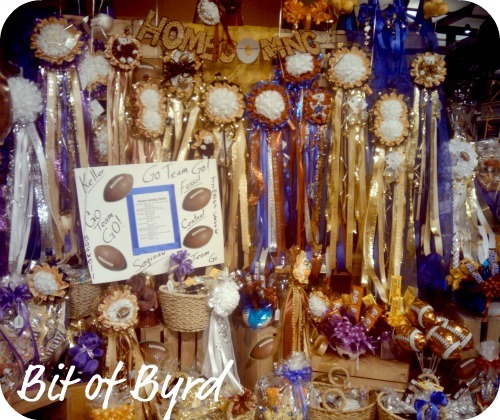 It is a Kroger Marketplace and if you have one near you, and you need a mum. Go and get it there. One of their really large single mums was only $36 dollars. I saw a smaller size at Albertsons for $65! Last year at Michaels a women ordered her daughter's date a garter... and paid $200!!!!! And even worse than that I know a parent that spend $450 !!!! on a mum!!! Breath... I know... It is crazy! Now you get an idea of why I made such a big fuss about making it myself. I just found out in the last few days my sister Brooke will be hear during my 10 yr high school reunion homecoming game. I am curious what her thoughts on the mums will be. Enough chatter... what do you have to show me?